Editor’s note: This is the first of two parts. Click here to read Part II of "Gulf Stream Rescue." A telephone rang at 9:20 p.m. in a quiet, sprawling, dimly lit room on the fifth floor of the Portsmouth, Va., federal office building — well after most offices were closed — and Petty Officer 1st Class Matt Doscher reached for the receiver. The 12-hour shift in the Coast Guard search-and-rescue Command Center was about four hours old, and things had been quiet for the watchstander. Doscher, one of a half-dozen men and women in the room who gazed studiously at computer screens, lifted the phone and answered. The watchstanders were aware that, a few miles away on the Atlantic, a nor’easter was coming. Gale warnings had been posted, and weather forecasters were expecting 12- to 15-foot seas in the Gulf Stream, with winds to 30 knots. It was the type of weather that gets the attention of Coast Guard search-and-rescue crews on aircraft and patrol boats, as well as those working computers in office buildings. But none of this crew of watchstanders could anticipate what was about to unfold. Within hours intense, constant 50-knot winds would begin bulldozing the ocean into 30- to 40-foot waves, catching four sailboats on their way to and from Bermuda. Breaking, black walls of water would roll three of the boats. An elderly man aboard another would be severely injured in a fall. One of the boats, a 70-year-old wooden schooner, would lose its steering, and its mainmast would threaten to topple. Two others would be abandoned at sea. The Coast Guard and Navy would launch helicopters and aircraft, and recruit commercial ships to rescue seven survivors. And before the storm passed, the owner and captain of one of the boats would die at sea in the arms of his first mate. That Wednesday evening phone call May 4 was the beginning of it all on the fifth floor in Portsmouth. Doscher heard the voice of a man who said he was the captain of the schooner Eskasoni. He didn’t want help, Norman Pilkey told Doscher. He just wanted someone to know where he was because Eskasoni had some potentially serious problems. Pilkey, 60; his wife, Philippa, 49; and two friends had left Gregg Neck Boat Yard in Galena, Md., the previous Sunday on a planned three-year trip to Ireland via Bermuda and the Azores. Their 50-foot (LOD) wooden schooner — an elegant white vessel with low freeboard and round bronze ports, built in Nova Scotia in 1937 — cleared Chesapeake Bay at Virginia Beach a day later and, in two days at sea, had reached a point about 250 miles offshore. At 9 p.m. May 4, they dropped the main, a cautious move to reduce sail in the dark. Almost immediately, there was a creaking sound, not Eskasoni’s normal complaint. The creak was followed abruptly by the mast dropping 8 inches straight down into the bilge, where a floorboard had rotted beneath it. The rigging slackened, and the wooden mast swayed precariously above the deck. The crew sprang into action. Dorsey Westcott, 52, began wrapping a spider’s web of lines around the shrouds, cinching them in to remove the slack that was more than the turnbuckles could handle. Pilkey grabbed the satellite phone. There was wind, and Eskasoni was doing fine sailing east with just a headsail. But Pilkey knew serious weather was approaching. Rough seas and a unstable mast were a prescription for catastrophe, so the skipper called the Coast Guard. Doscher listened to the calm voice on the phone, then consulted with his watch mate. They decided to ask Pilkey to call back every four hours with his position and condition. Pilkey said he would, and the call ended. As Eskasoni sailed in what now were increasing winds, she wasn’t alone on the dark Atlantic. Several hundred miles north, the 45-foot fiberglass Hardin ketch, Almeisan, was less than a day’s sail south of Long Island’s Montauk Point Lighthouse, en route to Bermuda. The captain, Thomas Tighe, 65, who had made this trip two dozen times, had a crew of four on board. Three of them — two men and a woman — had been recruited at sailing seminars that Tighe conducted in Connecticut. The fourth, Lochlin Reidy, 58, a Connecticut friend of the captain’s, had made the trip with Tighe a dozen times. Almeisan, Tighe’s yacht, was a cruiser’s delight, with a fully enclosed center cockpit and a large raised saloon in the pilothouse, where huge windows kept the interior bright. Almeisan had left Bridgeport, Conn., at 11:30 the night before, May 3, motoring east and escaping into the Atlantic at Plum Gut, a narrow passage in eastern Long Island Sound. Until Wednesday evening, the ketch had done little sailing, but the crew knew wind was coming. A large sailboat heading to Nova Scotia had told Tighe when he radioed them that a big storm was approaching from the south. “We’ll take the good with the bad,” he replied. Tighe and Reidy were aware of the storm advancing up the coast. They had plotted a course to the west of a direct route to Bermuda, figuring they had room to spare between their track and the storm’s path. They discussed the prospects with the crew without alarm. The weather on Wednesday had been sunny, as it would be on Thursday, May 5. Motoring, the new crewmembers had time and a level sea on which to learn Almeisan’s intricacies. Christopher Ferrer, 34, of Sterling, Mass., had been impressed, even before he boarded the boat, with Tighe’s crew manual of more than 300 pages covering details from the boat’s systems to emergency procedures. One rule, Ferrer learned, was inviolate: Everyone on deck had to be wearing a harness and be tethered to the boat. 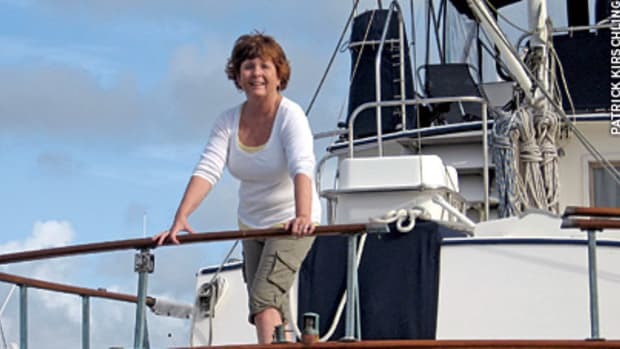 Kathy Gilchrist, 46, of Bloomfield, N.J., felt well informed by the manual and by Tighe’s habit of e-mailing the crewmembers with weather updates for the Gulf Stream in the weeks leading to their departure. Ronald Burd, 70, of Dover, N.H., had boarded Almeisan having read all of Tighe’s weather e-mails. He was convinced that the trip to Bermuda would be on flat seas. By Thursday morning, the seas in which Eskasoni was sailing, well south of Almeisan, were rough and getting rougher. Unable to reach the Coast Guard during the night, Pilkey made contact at 9:56 a.m. to report Eskasoni’s location. Winds now were 30 knots, seas a modest 6 feet. But with a damaged mast, the schooner’s options had been limited. Rather than motoring into the storm, which would have shaken the boat, Pilkey chose to heave-to. But for some reason, the boat wouldn’t turn into the wind, so he let her run with the wind at 4 to 5 knots. As Thursday wore on, winds increased to 55 knots, gusting to 60. And seas were building toward 20 to 25 feet. With their greater length, the storm waves actually gave Eskasoni a comfortable ride. But no one aboard was relaxing. Pilkey and his wife had lived aboard the schooner for 15 years and had replaced many of her planks and frames. They knew the condition of the mast — poised like a pile driver prepared to punch through the schooner’s hull — and were nervous. But when the skipper talked with Doscher on the phone, he didn’t ask for help. He wanted to make it to Bermuda. Perhaps halfway between Eskasoni and its destination, another boat — the 43-foot Hans Christian ketch Cosmos — was sailing west, its destination the tidal Nacote Creek in Port Republic, N.J., and a rustic dock on the border between the vast inland Pine Barrens and the coastal salt marshes. A windvane was steering Cosmos, and its two passengers were riding comfortably in the heavy bluewater boat. Wilson was working part time in their town’s one store, where Weber, a builder of custom homes, would go for coffee and sandwiches. In the winter, Wilson had asked Weber if he could join him on this trip, and he had flown to Bermuda about 10 days before. It was the first time Wilson, an Air Force veteran, had ever sailed, and he was getting a bit of a rough ride. Weber, who had sailed for 35 years, had made several single-handed passages to Bermuda. But Cosmos was new to him, almost a whim purchase two days before last Christmas. He also had bought a satellite phone in anticipation of Wilson’s presence and because his wife, Cheryl Weber, was always complaining she couldn’t reach him during his frequent offshore excursions. Lunch was going to be a cup of soup that only needed the addition of hot water. Weber had heated a pot of water, picked up the cup of soup, and began pouring over the galley sink. The scalding water splashed on his hands, and Joe Wilson gasped, “Oh, my God.” Actually, Weber’s hands weren’t hurt. What did hurt came next, when a wave caused Weber to go airborne inside the cabin and land sitting on the hot galley stove. A temporary brand of sorts burned through his dungarees. Weber had come to Bermuda on a single-handed leg from Key Largo, Fla., where he had taken the boat in February. Before he and Wilson left, they received from the Bermuda government a four-day forecast for wind and waves. On their fourth day out, a day before they were to arrive in Atlantic City, N.J., there was to be a gale developing. Weber wouldn’t have taken an 83-year-old into the teeth of a gale, even though Wilson has the body of a well-built 60-year-old. But Weber believed they would have little trouble making it ashore that last day, and so they left Bermuda. The wind was blowing 25 to 30 knots on Thursday, and seas were about 15 feet. But as the day wore on and the weather deteriorated, Weber prepared the boat for bigger seas. He raised a storm jib and fixed a storm trysail to the main mast. It was better to be prepared than to change sails once the storm was raging. There are both civilian and uniformed Coast Guard watchstanders. Doscher and the other Coast Guard personnel wore their light blue shirts with dark blue trousers and black shoes. On their shirts, they wore blue name tags with white letters and any ribbons they had earned. Doscher’s shirt was burdened with 17 ribbons awarded during his 11 years of service. The watchstanders leaned toward their screens in silence, looking for evidence of electronic signals — EPIRBs and ELTs (emergency locator transmitters) — from vessels in distress. But despite the growing wrath at sea, none of these signals had appeared as Thursday evening darkened the Portsmouth skies. By this time another sailboat was on the Atlantic, Bermuda its eventual goal. At Ease first was going to make a stop in Charleston, S.C., however. Robert Cummings, 40, an Army warrant officer who flew Blackhawk helicopters, had begun checking weather reports Wednesday. He was accustomed to reading his own weather charts and saw that there was an area of low pressure about 130 miles offshore. He knew that forecasters were predicting 20 knots gusting to 30 knots, with waves in the 8- to 10-foot range. Cummings felt comfortable when, at 8:30 a.m. Thursday, he and his crewman, yacht broker Jerry McCarthy, 35, of Charleston, cast off from the Norfolk, Va., area in At Ease, Cummings’ Bavaria 41, which McCarthy had sold him new two years before. They motored through a tunnel gap in the Chesapeake Bay Bridge Tunnel before setting sail on a beam reach in a nice southeasterly wind. They set up two-hour watches at 4 o’clock that afternoon, and the way the boat was working — one of those perfect sails, the sort that brought the word “fantastic” to Cummings’s lips — they thought they had a chance in the upcoming Charleston to Bermuda Race, the object of this voyage. At Ease was slicing eight or nine nautical miles off its trip every hour, and as the skies darkened the wind ratcheted up, reaching 20 to 25 knots regularly. Cummings added two reefs to the mainsail some time after midnight and the Bavaria rocketed on south toward Charleston, a gleeful sleigh ride. There was less merriment aboard Almeisan. Christopher Ferrer, offshore for the first time, was seasick. The first wave of nausea came at mid-morning Thursday when Almeisan, named for a star in the Gemini constellation, finally had enough wind to sail. When the wind shifted, the engine again was needed. Ferrer finished his dinner of beef stew, but at 8 p.m., when he went below to make a log entry, he lost his dinner and would be sick for the next 24 hours. Adding to the intense discomfort that made Ferrer want to curl up and lie on deck, the wind finally began to pipe up to 30 knots and more, with waves 10 feet. The mizzen and staysail were moving Almeisan along nicely, although Tighe ran the engine to generate electricity. It was about this time that the skipper predicted they would cross the Gulf Stream Friday, May 6, in a gale. On board Eskasoni there was apprehension, as well, because the mast couldn’t be repaired until the vessel found a safe harbor. And there were other problems. Since Wednesday night, Pilkey had been sailing without the use of his engine, which apparently had been flooded when a big wave pooped the schooner. Perhaps it was the same wave that had detached the cables that turned the rudder, but it had taken more than a day for Pilkey and his crew to discover they had no rudder. The boat’s track on the chart plotter looked like some child’s Etch A Sketch drawing, as Eskasoni wandered in her downwind ride. Moreover, it wasn’t out of disregard that Pilkey hadn’t contacted the Coast Guard every four hours. The rented satellite phone had stopped working, having apparently succumbed to the salty environment. Pilkey and his crew figured the steering could be restored. Donning his diving gear, Pilkey went overboard and secured a woodworking clamp to the trailing edge of the keel-hung rudder. He then attached the unused sheet from the mainsail to the clamp and led the ends forward to the cockpit. Now Eskasoni could be turned, and some place about 500 miles east of Charleston — by Pilkey’s reckoning — the boat came about and began sailing in the general direction of Beaufort, N.C.
Friday was a blur for Ferrer aboard Almeisan, and it wasn’t much better for Ronald Burd. Burd hadn’t been seasick in 50 years, when he was aboard a ship in the Mediterranean. He had sailed his own boat, a Caliber 38, the length of the East Coast without problem. Now he was using Almeisan’s barf bags along with Ferrer, who often as not was vomiting on deck. Seas had built during the day Friday. Lochlin Reidy had been doing double shifts on watch to make up for the incapacitated crewmembers. By Friday evening the exhaustion, combined with the rougher ocean, caught up with him. He went below as sick as Ferrer and Burd, not to be seen on deck for the next 24 hours. As bad as these three sailors felt rocking in the Gulf Stream, they were in no mortal danger. To their south, neither of the two men aboard Cosmos — not Wilson on his first sail nor Weber, the seasoned single-hander who at times had known seasickness — was feeling any effects from the storm. The windvane was steering the ketch, and the storm jib and trysail were driving her toward Atlantic City at a reasonable rate. Except to observe their surroundings, the men stayed nestled below for most of the morning Friday. It was some time before noon that Weber decided their ride could be improved, so he announced his plans to Wilson. Cooking was a bit of a struggle, but Weber managed to turn out a meal of bacon and eggs, which both men consumed while seated at the sturdy saloon table — a testament to the boat’s heavy construction — which was supported by two big stainless steel tubes welded to flanges screwed to the wooden cabin sole. It was midafternoon before Weber finally got into his harness and foul weather gear and opened the companionway hatch. Outside, he saw 30- to 35-foot waves with long, gray troughs between the peaks. He clipped on to the starboard jackline and crawled forward on his hands and knees across the cabin top to the main mast. When he reached the mast, he sat for a while watching the sea. Then, seizing a grab rail, he stood and began lowering the storm trysail, his back to the wind and waves coming from the north. At about 3 p.m. a wave blindsided Weber. It slammed into his back, and Weber was lifted from the cabin top and thrown across the boom, one foot caught in the lazyjacks. A second wave came, and, still entangled, his whole body was pinned against the rigging. He was under water, and time was passing very slowly. Weber was disoriented; he didn’t realize the boat had capsized. He waited and waited until Cosmos finally shrugged off the water, and he found himself hanging upside down by his still-snared foot. Cosmos sailed on under the storm jib as if nothing had happened, and Weber, freeing himself from the lazyjacks, finished tying off the trysail and made his way back to the companionway, expecting Wilson to greet him with concern. Blood was everywhere in the cabin. Looking down, Weber heard Wilson moaning and saw him sprawled along the cabin floor at the foot of the companionway ladder, his feet toward the bow and head soaked in blood. Beyond his feet, the saloon table banged from one side of the cabin to the other, its legs still screwed to the cabin sole that had ripped loose. Unsure what to do first, Weber began patting blood from Wilson’s head and then attempted to secure the table. Next he phoned his wife, Cheryl, a nurse practitioner. The older man had a 6-inch gash across the back of his head, and Weber was concerned about a skull fracture. Cheryl gave him instructions for testing Wilson’s condition: move a finger before his eyes for Wilson to follow. He passed that test, but he complained that he was tired and didn’t seem to know he was on a sailboat. Weber asked his wife to call the Coast Guard. Once again, a telephone rang in Portsmouth. This time it was civilian watchstander Geoff Pagels who took the call. Weber was calling from Cosmos on satellite phone, and he explained Wilson’s condition and gave Pagels his vital signs. He told Pagels that Wilson was conscious but unaware of his surroundings. Wilson didn’t know where he had been or where he was going, the captain explained. He had “stabilized” Wilson, Weber told the watchstander, and he was aware of the storm building around him, 280 miles east of Cape Hatteras. He was stalling his trip to Atlantic City to avoid the worst weather. Pagels was impressed. Pagels noticed on his screen that the USS Trenton was closest to Cosmos, so he requested the Navy’s assistance. It was around 4 p.m. when Cosmos and the Trenton made contact. The ship would arrive at 8 a.m. Saturday to evacuate Wilson. A half-hour later, the Trenton called again. Cosmos was in the eye of the storm, Weber was told. By Saturday morning, seas would be rougher, so the Navy was planned a helicopter rescue at 2 a.m. Saturday. When the time came, Weber went on deck. A misty rain was blowing out of the dark, and Cosmos was still riding under a storm jib. Then a bright light shone out of the distance, and a helicopter circled the sailboat twice before coming to a hover. Looking up, Weber saw a side door slide open and a man descending on a cable. Not long after Wilson was injured on Cosmos, Robert Cummings, who had gone off watch on At Ease at 4 p.m. with minor seasickness, awoke and looked at the ship’s clock. It was 5:18 p.m., and Jerry McCarthy was in the cockpit, tethered and wearing an inflatable life jacket. Cummings heard McCarthy yelling: “Bob, you’d better put on your foulies.” When he climbed into the cockpit and clipped on, Cummings found the wind was blowing a steady 40 knots, and seas had doubled in size, up to 25 feet. Yacht broker McCarthy, a professional delivery captain with tens of thousands of offshore miles, told the captain winds had turned from southeast to northeast in five minutes, and seas had grown confused. Sets of 20-foot waves from the east now were colliding in geysers with sets of 25- to 30-footers from the northeast, like a scene from the Sorcerer’s Apprentice segment of Disney’s “Fantasia.” McCarthy had doused the main and was running under a reefed genoa, but the boat constantly wanted to broach. Figuring that the northerly wind was the precursor of a front and wouldn’t be around long, the men decided to heave-to. All that accomplished was to spin At Ease in circles, so they decided to let the boat lie a-hull, with all sails furled. Now At Ease at least rode comfortably. They started to talk about deploying a drogue off the stern to slow the boat’s downwind progress in winds that, on the wind instrument, had hit 58.6 knots and were blowing spindrift off the tops of the waves, turning the sea into solid white foam. It was now about 6:15 p.m., still light enough to see that the waves had built to 40 feet. The boat was pointing west, with the wind and waves hitting the starboard side, where Cummings and McCarthy both sat, strapped in. What happened next was instantaneous for Cummings, almost slow motion for McCarthy. The boat rode to the top of a monstrous wave — McCarthy figured maybe 50 feet — and At Ease suddenly was on her side. McCarthy was looking down into the trough below. Then the boat fell. It seemed to take two seconds before At Ease smashed into the trough on her port side. McCarthy had a death grip on the binnacle but knew he was going in the water. The advancing wave from which the boat had fallen pushed against the upturned hull, and At Ease continued to roll, its mast swinging down into the sea. McCarthy had his hand on his harness, ready to unclip if he was dragged under. For a moment, Cummings thought of unclipping, too. His instinct told him his thought was based in panic, and the soldier abstained. Still, there was no telling how far At Ease, her fin keel now pointing toward the sky, was about to roll.